Herne is portrayed as a wild, ghostly man with antlers, an ancient Pagan God from long before Christianity known as Cernunnos. Cernunnos is a horned god found in Celtic mythology. He is connected with male animals, particularly the stag in rut, and this has led him to be associated with fertility and vegetation. Depictions of Cernunnos are found in many parts of the British Isles and western Europe. He is often portrayed with a beard and wild, shaggy hair -- he is, after all, the lord of the forest. With his mighty antlers, Cernunnos is a protector of the forest and master of the hunt. He is a god of vegetation and trees in his aspect as the Green Man, and a god of lust and fertility when connected with Pan, the Greek satyr. In some traditions, he is seen as a god of death and dying, and takes time to comfort the dead by singing to them on their way to the spirit world. In Margaret Murray's 1931 book, God of the Witches, she posits that Herne the Hunter is a manifestation of Cernunnos. Because he is found only in Berkshire, and not in the rest of the Windsor Forest area, Herne is considered a "localized" god -- and could indeed be the Berkshire interpretation of Cernunnos. During the Elizabethan age, Cernunnos appears as Herne in Shakespeare's Merry Wives of Windsor. He also embodies fealty to the realm, and guardianship of royalty. In some traditions of Wicca, the cycle of seasons follows the relationship between the Horned God -- Cernunnos -- and the Goddess. During the Autumn , the Horned God dies, as the vegetation and land goes dormant, and in the Spring, at Imbolc, he is resurrected to impregnate the fertile goddess of the land. However, this relationship is a relatively new Neopagan concept, and there is no scholarly evidence to indicate that ancient peoples might have celebrated this "marriage" of the Horned God and a mother goddess. Because of his horns (and the occasional depiction of a large, erect phallus) Cernunnos has often been misinterpreted by fundamentalists as a symbol of Satan. 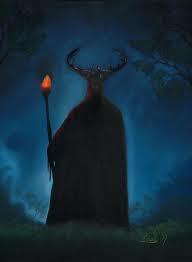 Certainly, at times, the Christian church has pointed to the Pagan following of Cernunnos as "devil worship." This is in part due to nineteenth century paintings of Satan which included large, ram-like horns much like those of Cernunnos. Both Shakespeare and Samuel Ireland identify Herne as a real historical individual, the latter saying that he died an unholy death of the type that might have given rise to tales of hauntings by his unquiet spirit. The fact that Herne is apparently a purely local figure supports this theory. One possibility is that Herne is supposed to be the ghost of Richard Horne, a yeoman during the reign of Henry VIII who was caught poaching in the wood. This suggestion was first made by James Halliwell-Phillipps, who identified a document listing Horne as a "hunter" who had confessed to poaching. The earliest edition of The Merry Wives of Windsor spells the name "Horne".